Wearing blue today for our baby boy and the first week of college football, Go Gators! Gender: Our baby BOY, Rowan! Best moment this week: Confirming Baby M's gender! I guess our intuition was right, we've most definitely got a little man in there! We've started calling him by his name and all of a sudden things seem super real! Despite my efforts to wake the babe by drinking OJ and eating sweets, Rowan was sleepy during the ultrasound. He had his long legs stretched out and crossed them at one point, while one of his arms was stretched out in the opposite direction. Maternity clothes: Still in non-maternity clothes but I did pick up Gap maternity leggings which I'm positive will be on repeat all fall and winter. Stretch marks: None yet. I'm doing better remembering to apply my Mama Bees belly butter! Miss anything: Coffee! I know its safe in moderation but I just didn't want to take a chance. And bloody marys at blogger brunches. Movement: Not yet, hopefully I'll start feeling some flutters in the next 2 weeks! Cravings: Pumpkin-flavored things (no surprise there). Still have an aversion to chicken. 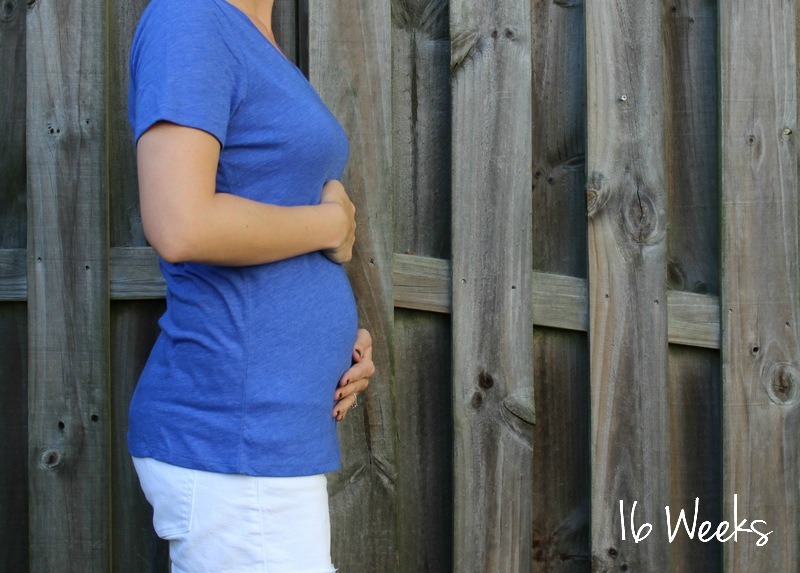 Mamas- do your aversions stick around after the first trimester/pregnancy?! Nursery: This will remain a guest room for the next few months, but hopefully I can decide on a color so we can paint it soon. Not sure if it's nesting kicking in already but I have the urge to clean out our guestroom closet to make room for baby clothes! Looking forward to: Visiting my sister-in-law in Chicago this weekend and hopefully feeling some baby kicks! Oh yeah, and those Labor Day sales! Rowan? What a great name! I love the little outfits that you have for him already. Awww love the name Rowan! How cute!!! And your bump is adorable! You look great!! Rowan!! I looove it, so cute. I'm craving all things pumpkin right now, too -- tis the season! Yay for your upcoming Chicago weekend! Love your sweet little bump and the name is so great!!! I love that you don't hear that often - and it makes it so unique!!! awww yay Rowan! What a cute name :) Will you tell us how you decided on it? Middle names? Love the name, so cute! Look at that little belly -- so cute!! I can't wait to hear what your thoughts are on the GAP leggings. I was lucky enough to not have any food aversions. Regarding coffee go for it. I treat myself on Fridays to a small soy latte. Just make sure to drink extra water when you decide on a cup of coffee. Love the name Rowan!!! He is going to be way too cute in those onesies!